Finally! Between bad weather, traveling, and just flat out not enough time, the hubs and I made it out to the farm to prepare our plot. Despite my farmer friend discing it with his tractor in March, the plot was covered with weeds due to our late arrival. I have the plants ready for this area in my greenhouse and some that have been living happily in my garden area. They just need to be moved. Let me say that my husband in awesome. He is such a tremendous support to me and my gardening craziness. Knowing that we would have a weed issue, he took a large riding lawnmower out to the farm and mowed everything down to make tilling easy. This is what it looked like when I arrived. It almost resembles a yard if it wasn't for all of the green stuff being weeds. This is what it looked like prior to my husband mowing it. Here is the hubs tilling for me. Beyond him, do you see how incredible the fields look? In Iowa, we are having a great farming season. The ag reports say that we have over 90% of our fields planted and growing which is at top of the rest of the US. This is what my plot looked like after we were done. I sprung for weed barrier this year. I found it on sale and after weighing out the my options, decided to purchase. The farm has mutant weeds, layers of newspaper and hay/straw/grass clippings are absolutely no match for the weeds at this place. Last year, I could have weeded the plot 2 times a day and still would not be able to keep up. I figured the cost of this protector would be replaced by a better crop than I had last year. I also decided to use the cardboard box the barrier came in as barrier. The open area will be home to my potatoes. I am chancing planting them this late. Early potatoes are always good. This is the first plant I planted at the farm. It is a mystery squash and the poor guy is so unhappy that I moved him. I hope he comes back and that I didn't off him. 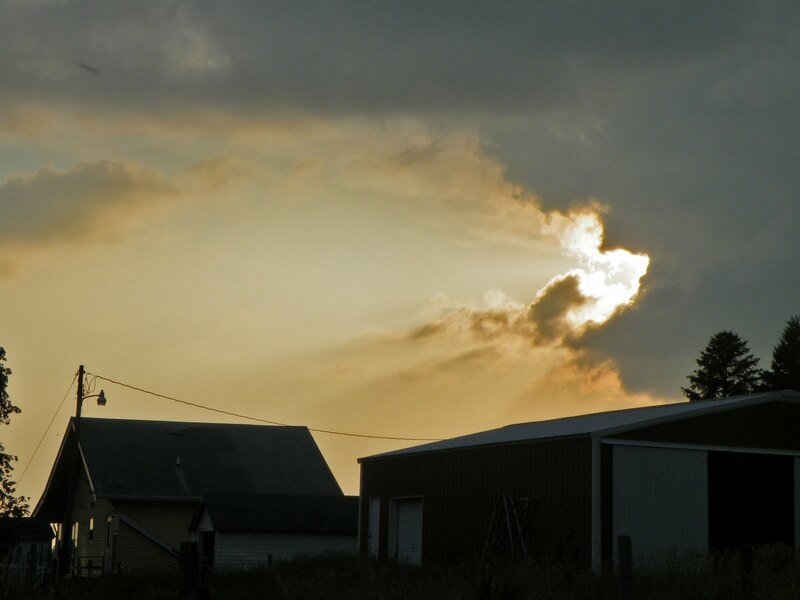 Before we left the farm for the evening, the sun was saying goodnight behind the clouds. Wow! That was a LOT of work, but it sure looks good! I love the surrounding scenery. Rolling hills are always pretty.